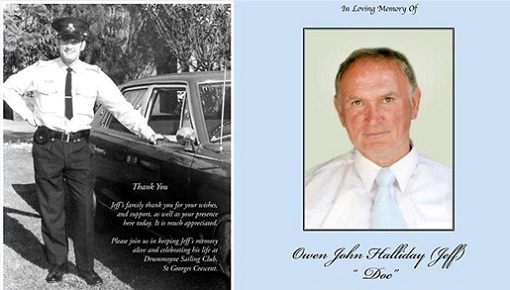 The late detective sergeant Owen John (Jeff) Halliday (aka Doc). NSW detective Owen ‘Doc’ Halliday mixed it with some of Sydney’s roughest and dirtiest criminals – invariably coming out the winner. Detective Halliday will be given a full police funeral tomorrow, attended by the state’s top officers after he lost his battle with motor neurone disease earlier this week. Halliday, 60, was responsible for bringing ‘Mr Rent-a-kill‘, Christopher Dale Flannery, back to Sydney after he went into hiding in Melbourne in the 80s. ”He was one of the most tenacious detectives I have known,’’ said Deputy Police Commissioner Nick Kaldas. Halliday was a mentor to many of the state’s now-senior police and worked on some of the most high-profile cases of the 80s. These included the Family Law Court bombings, the murder of Justice David Opas and the murders of the Turkish consul and his bodyguard in the eastern suburbs. He also investigated the gangland murders of underworld figures Mick Sayers and Roy Thurgar . Halliday, or ‘Doc’ as he was known, joined the force in 1968 as a police cadet and was sworn in as a constable in 1970. Much of his career was centred in the Balmain area where he became known to locals, both good and bad. Besides a passion for the police force Halliday was a talented footballer playing first grade rugby league for the Canterbury Bulldogs in the 80s, in the era when they were known as the “Entertainers”. Halliday retired as a decorated detective sergeant in 2003. A service will be held at Macquarie Park Crematorium today. He is survived by his wife Kay and his two sons Shane and Chad, both serving NSW police officers.